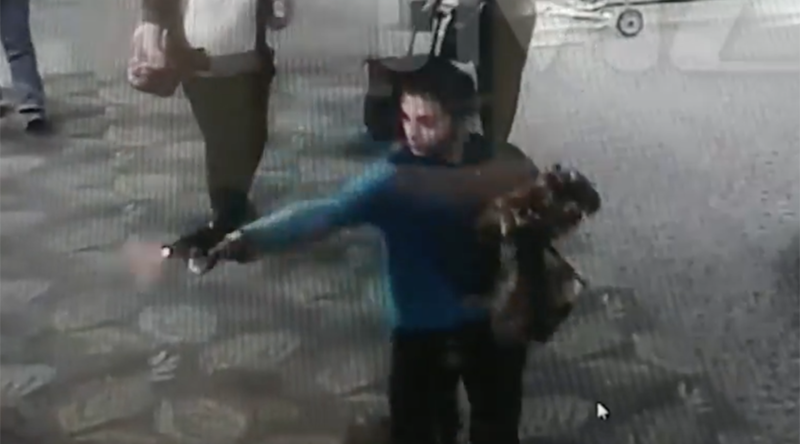 Video footage has emerged of a mass shooting at Fort Lauderdale Airport, Florida, showing shooter Esteban Santiago-Ruiz casually pulling a gun out of his pocket as he walked through baggage claim on Friday. The footage, which was obtained by TMZ, appears to be taken from a security camera inside the airport. Two children are seen walking by the camera before the Iraq war veteran pulls out the handgun, a 9mm Walter PPS, and begins firing. After the shots are fired, people are seen taking cover where possible, including behind a baggage trolley. The 26-year-old killed five people and wounded eight in the shooting, before dropping the gun and waiting to be arrested. He was charged by federal prosecutors on Saturday and is due to appear in court in Broward County on Monday. He’s likely to face the death penalty. Santiago-Ruiz arrived at the airport from Anchorage, Alaska after a layover in Minneapolis. His legally possessed firearm was in his checked luggage within a locked hard-sided container, as per TSA regulations. He was then able to access and ready the weapon inside the airport. One of Santiago-Ruiz’s family members told NJ.com that the attacker had “lost his mind” in Iraq and had been hospitalized for mental health issues after returning from his tour with the Puerto Rico National Guard between April 2010 and 2011. His aunt, Maria Ruiz Rivera, said that despite the issues that emerged after his Iraq tour, he had been doing well recently, particularly since the birth of his son.